Nowadays parents of young or school-aged children send their kids to yoga because they want them to embody the myriad benefits of yoga: strength, focus, flexibility, and calm. As a children’s yoga teacher, teacher trainer, parent, and educator myself, I agree with the notion. Still, I hope as parents, we can see the benefit of starting a home yoga practice with our children. Because children are accustomed to having to learn everything, if we come at it with a beginner’s mind and learn alongside them, we are: inspiring them to be lifelong learners, normalizing self-care, and bonding over healthy habits. I do encourage you to send your children to learn yoga, mindfulness, and other contemplative practices with experts. Just not at the expense of becoming a family that creates and propagates #LifelongHealthyHabits together inside the home. Let’s explore how kids and families benefit from yoga and mindfulness. As we read on, let’s take a collective deep breath. A pause for gratitude. And now we continue. Did you know that controlling the breath through yogic breathing can also help us stimulate the parasympathetic nervous system, therefore helping our bodies to regulate the fight or flight response? That means with regular practice of breathing during non-crisis moments, you and your children can learn to calmly access breathing exercises in preparation for crisis moments. Just think about Stop, Drop, and Roll. You will never forget to do that in a fire because it was repeated and repeated in your childhood. 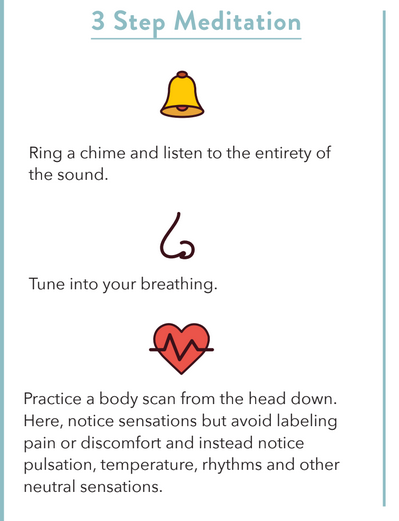 You and your children will never forget to breathe in a crisis when you make it a priority to practice breathing in fun and engaging ways that feel low-pressure. Click this link to try the bumblebee breath together! Don’t forget to provide real life context. Your kids need you to connect the dots between what you are doing together and the real world. “My love, we can use Bumblebee Breath when we feel overwhelmed, like the time we locked our keys in the car.” Encourage your little one to repeat the skill once you share it with them. Once they do, acknowledge their effort and then ask them what they will do when panic may strike. This final step allows children to take ownership. So empowering. Try the bumblebee breath together! Our children are watching us. It’s ever apparent when they copy our bad habits. We arrive at moments of self-doubt and shame when our toddler mutters a four-letter word. The same can be said for your best qualities and habits. I know that when my child was just 11 months old, she rolled out a yoga mat, grabbed the chime, and took several deep breaths… 100% independently. I was shocked because she learned it by observation. She watches my daily centering practice and thus it becomes hers. Seeing her interest, I encouraged and cued her. “Charlie, breathe in,” I say. She opens her mouth and takes cute, audible breaths. She started her yoga practice before she turned one! Now she knows to breathe whenever we get in the elevator, because it’s my personal practice, too. Can you find a moment as awkward as the elevator or as stressful as getting your family ready in the morning to model and normalize a mindful approach? Did you know that listening is a teachable skill? AND that we need to teach it so kids (and us adults) can learn it? Try this one together to inspire true listening. The following activity I intended so that children can learn to listen to the beginning, middle, and end of a sound. The second part is so they can learn to tune into the sound of their breath, something to help them stay ever present as their lives go. And third, they can learn to notice sensations of the body and become less reactive to them. From a young age, children can learn to calmly respond to discomfort rather than overreact to every bump and bruise. Together, the 3-part meditation gives kids the tools to listen to the external world, the teacher of presence that is the breath, and to the body, to whom we must humbly listen and do what it needs. The ability to listen in these three ways provides adults and children with a richness to enjoy life and really be there for themselves and others. Children are tasked with so much to do these days including academia, extracurricular, and constant connectivity from iPads and other devices from increasingly younger ages. To learn the balancing act of life so that family, self-care, community, healthy sleep, and other priorities also honored, we must teach children balance. Doing a tree pose (see below) can teach them literal balance, strengthening their vestibular system as they wiggle standing on one foot. It helps them get a better sense of their bodies in space, improving their proprioception. Learning to live in a balanced way takes discipline and dedication. If we want our children to learn to be more balanced around bedtime, they need to unplug from their devices and get their bodies and minds in a state ready to relax. Let’s help our children become more balanced by ritualizing bedtime. Make it a special family affair to do gentle yoga poses, mindfulness activities, short stories, coloring, and intentional connection and relaxation. Pre-order My Yoga Workbook: Mindful Bedtime Habits (as seen on ABC and FOX) to get all the tools your family needs to help your children learn to be balanced at bedtime. As you teach them how to relax, you will end up benefiting too. Not only will better bedtime habits result in kids feeling more rested for school, it also stabilizes their moods. YOU TOO will feel the effects of spending your time mindfully and intentionally. Through these lifelong healthy habits, you can all learn to live a more balanced way. Yoga poses such as rainbow pose depicted here with tree pose, help our bodies bend, strengthen, and become more flexible. These are very important to our emotional and physical well-being. Being too rigid leaves us prone to total breakdowns. For example, sometimes we’re very stubborn or insist things are certain way. Then, when (not if) life gives us something completely different, the mental flexibility to roll with the punches isn’t in place to support us. Physical flexibility works the same way. If you fall down and your hamstrings are really tight, you might injure your back. But, if you have flexible muscles, you’re more likely to get back up again after a fall.